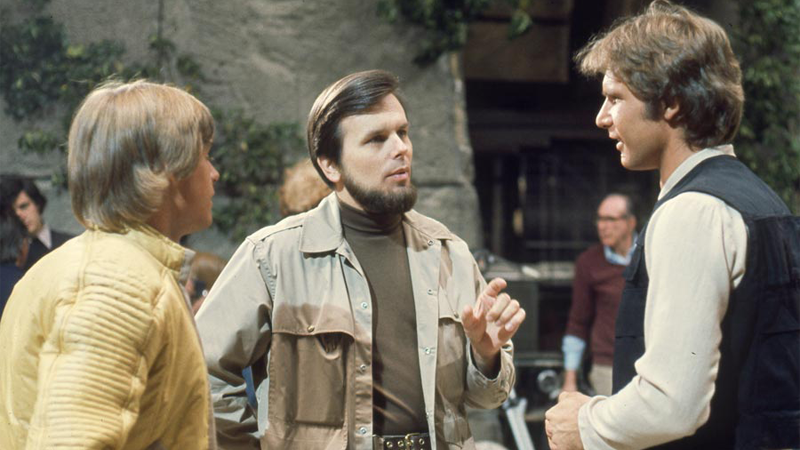 Kurtz talking to Mark Hamill and Harrison Ford on the set of Star Wars. Kurtz first rose to prominence in the ‘60s as an assistant director and producer. Upon returning to the movie industry after serving in the U.S. Marine Corps in Vietnam, he was introduced to a future partner by Francis Ford Coppola: a young George Lucas. Lucas and Kurtz’ partnership would flourish over the next decade, as the Lucas went on to create first American Graffiti and then, of course, Star Wars. Kurtz’ role as producer on both movies was vital. He helped arrange the deal that would bring American Graffiti to life before it became an Oscar-nominated surprise hit, and then after Universal Pictures passed on funding Lucas’ next project—a Flash Gordon-inspired sci-fi saga that would one day become Star Wars—Kurtz helped negotiate with 20th Century Fox for a deal that would change Hollywood forever. And not just through the influence of Star Wars as a movie, but in everything from the control directors and producers had over their studio projects, to the rise of the importance of movie merchandising—a behemoth Star Wars helped create down to the fact that Lucasfilm kept merchandising rights to itself. Although Kurtz would decline to return to Star Wars a third time for Return of the Jedi—he went on to produce cult hits like Return to Oz and The Dark Crystal—his impact on the franchise is indelible. Kurtz leaves behind his wife and three children, and our thoughts go out to them.